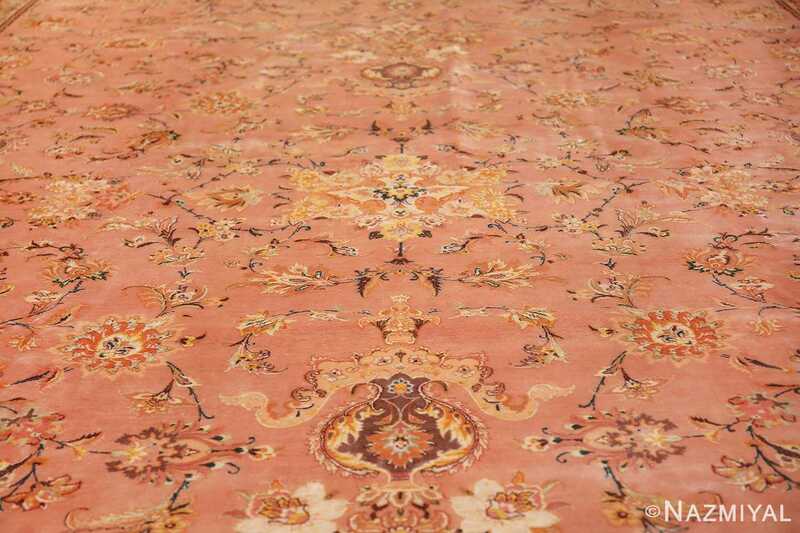 Breathtaking Large Size Light Pink Background Silk and Wool Vintage Persian Tabriz Rug , Country of Origin / Rug Type: Vintage Persian Rug, Circa Date: Late 20th Century – This beautifully refined vintage Persian Tabriz rug contains a large rectangular light pink field framed by three separate floral patterned borders. 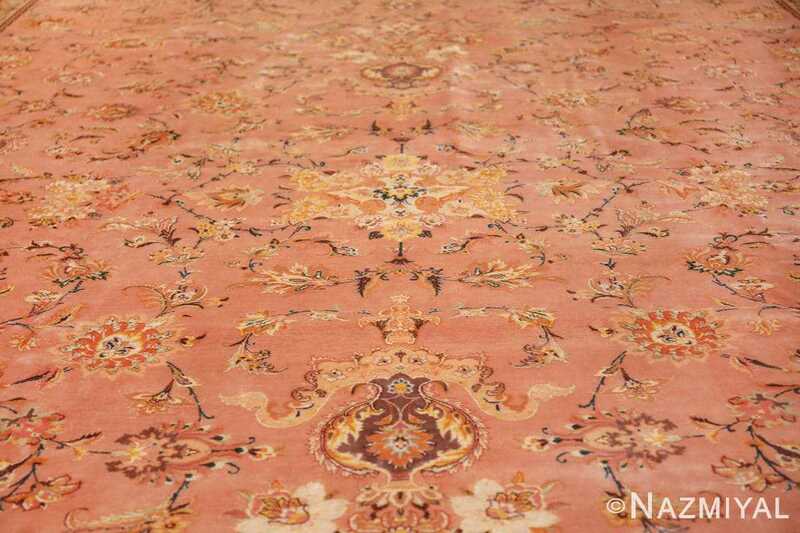 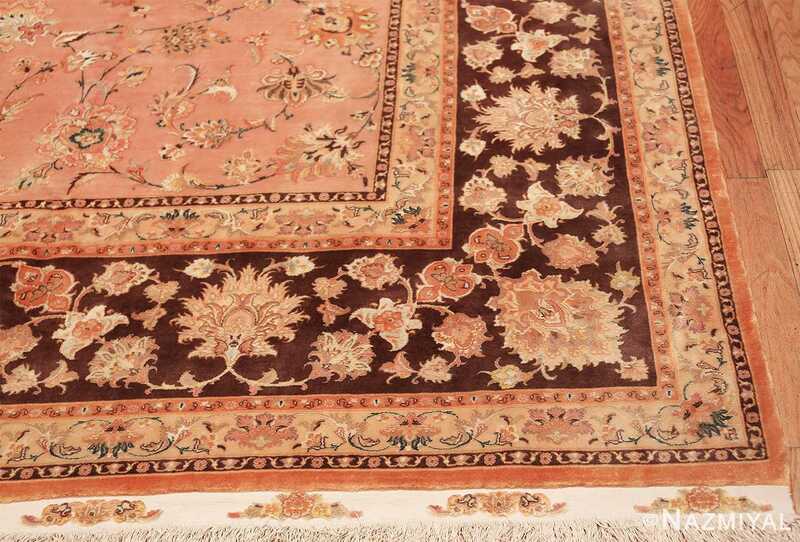 The elegant and open floral patterns in the center section of the vintage Persian rug are simply breathtaking. 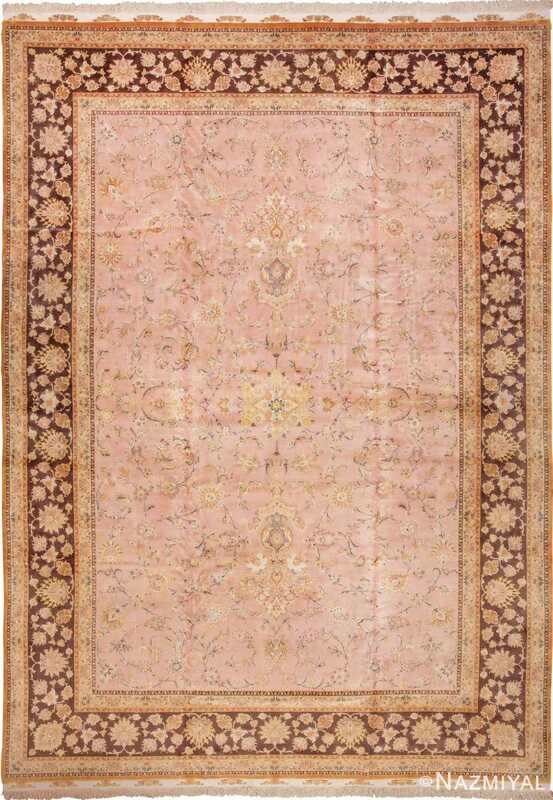 The vast open feeling created by the expansive floral vine scroll design, allows the subdued light pink backdrop to be seen clearly. 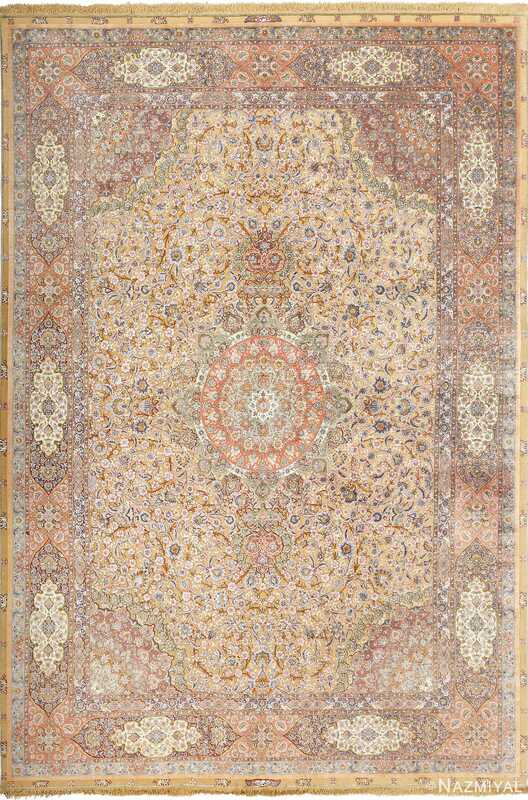 These vine scroll or Islimi arabesque patterns are symmetrical which gives this magnificent wool and silk rug a balanced feel. 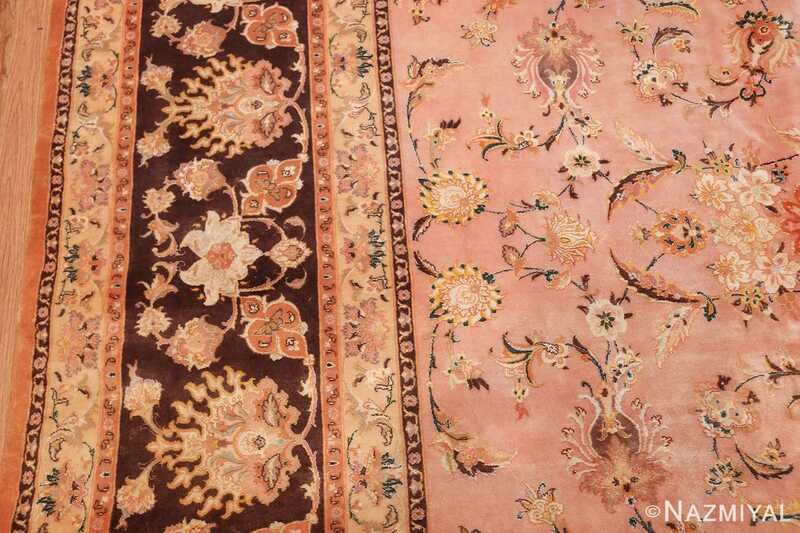 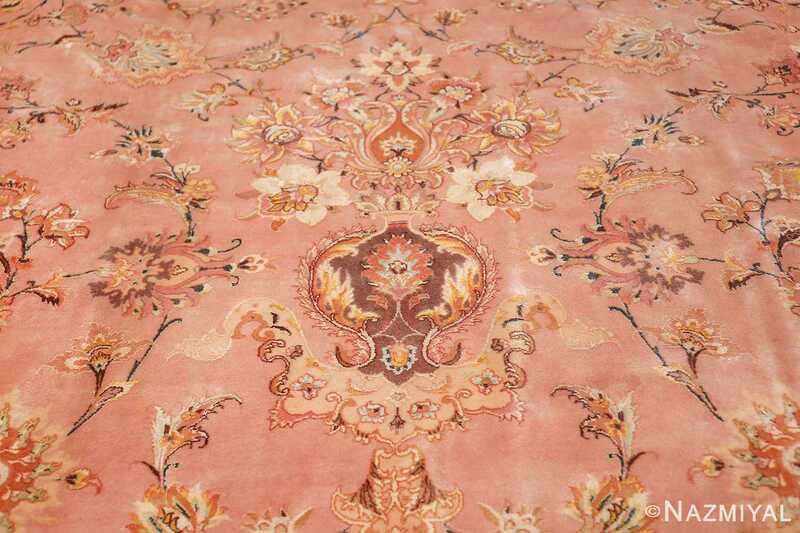 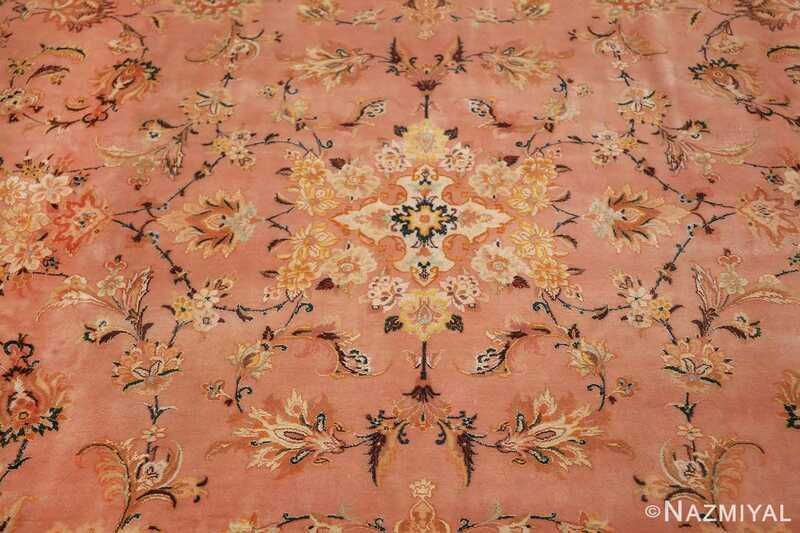 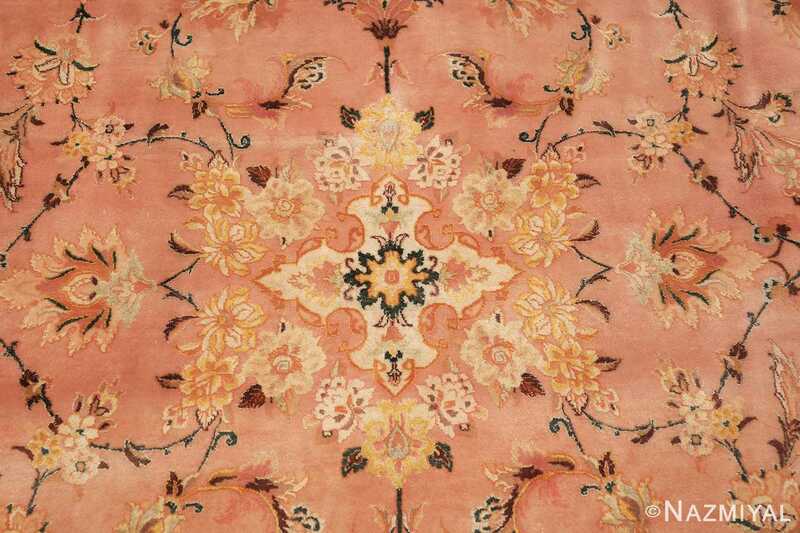 The flowers filling the rest of the light soft pink background of this elegant silk and wool vintage Persian Tabriz rug are detailed and varied. 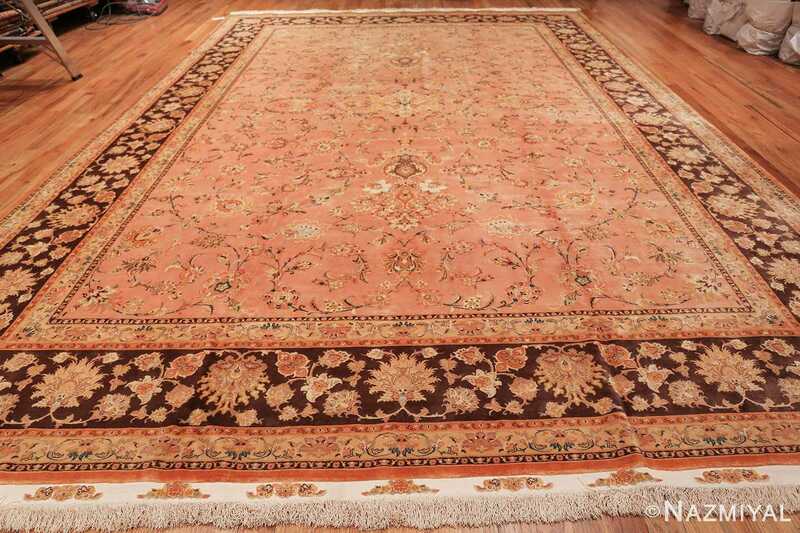 In the very center of the vintage rug, bouquets of bright gold’ish yellow and white flowers radiate out from a daisy like flower. 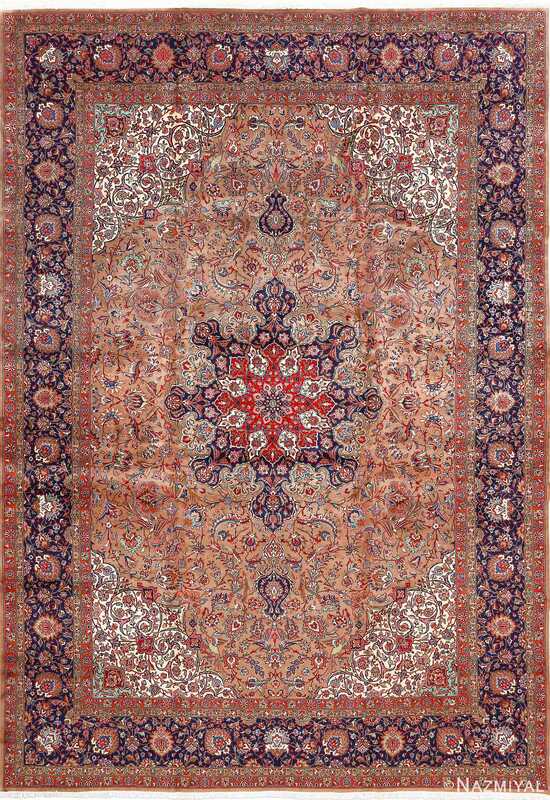 The center flowers of this Persian Tabriz rug are abstracted by a horizontal and vertical kaleidoscope effect. Surrounding the bright centerpiece, more flowers seemingly on vines spread out and around the Persian rug. 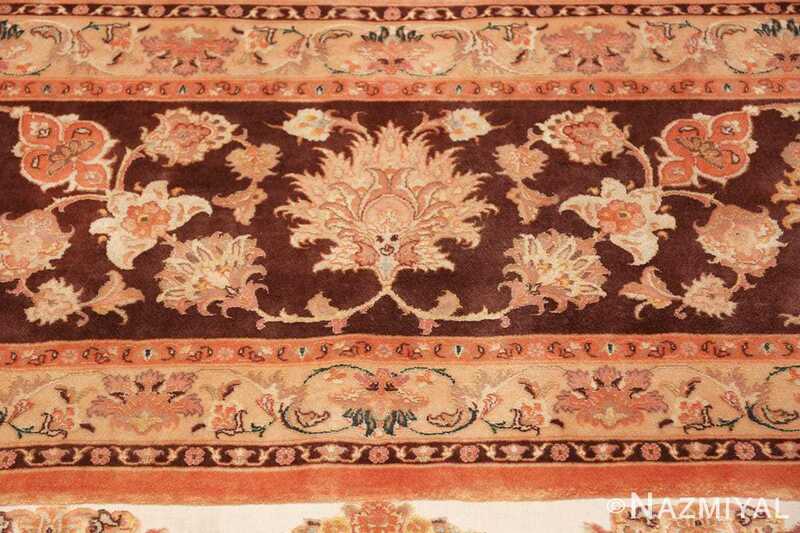 The vines these flowers are comprised of a darker blue, and are accented with tiny leaves in varying colors. The finely drawn out vines are about as thin as a strand of yarn and abstract flowers mark the ends of each one of these vines. Above and below the bright yellow centerpiece are emblems resembling flowers in a vase. A light purple vase design is decorated with white and gold leaf patterns. Growing out from the top of the upper vase symbol, and the bottom of the lower vase symbol respectively, white flowers resembling trumpet lilies, and yellow and orange flowers resembling sunflowers. 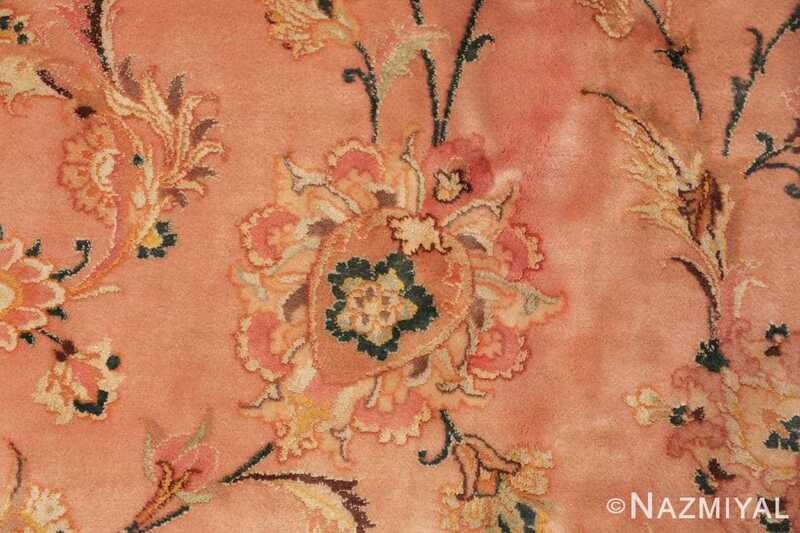 These vase patterns are subtle, yet quite detailed. 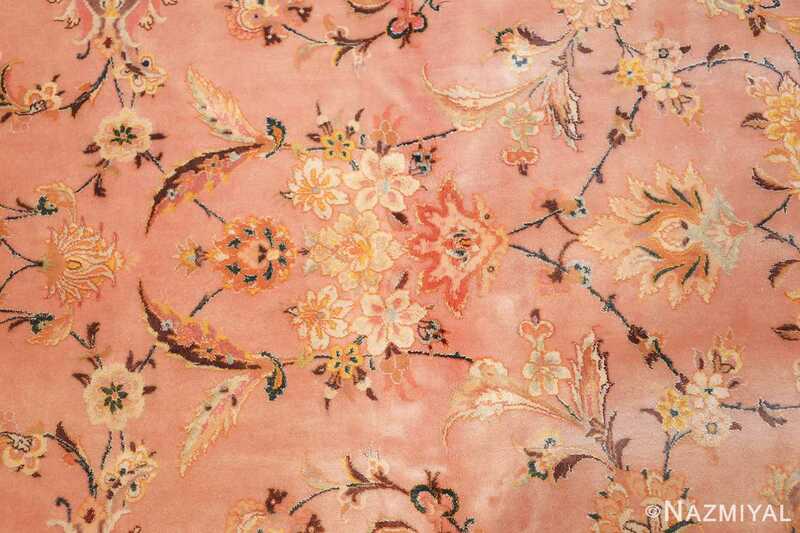 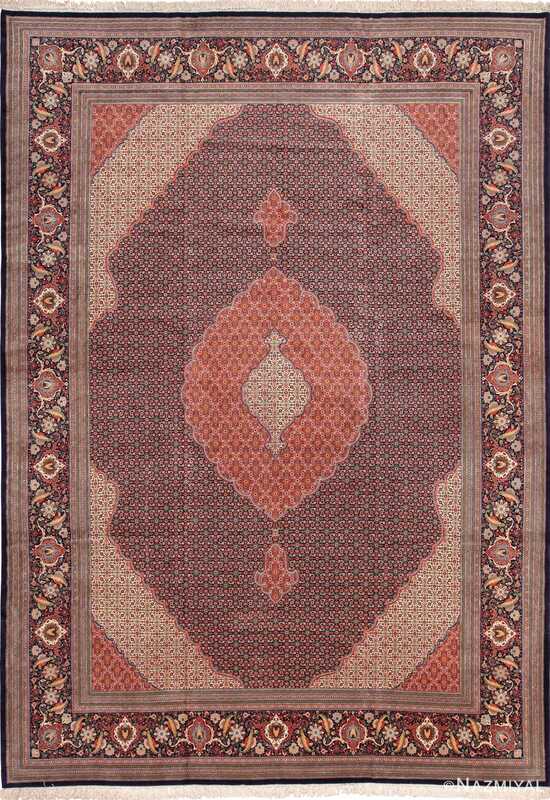 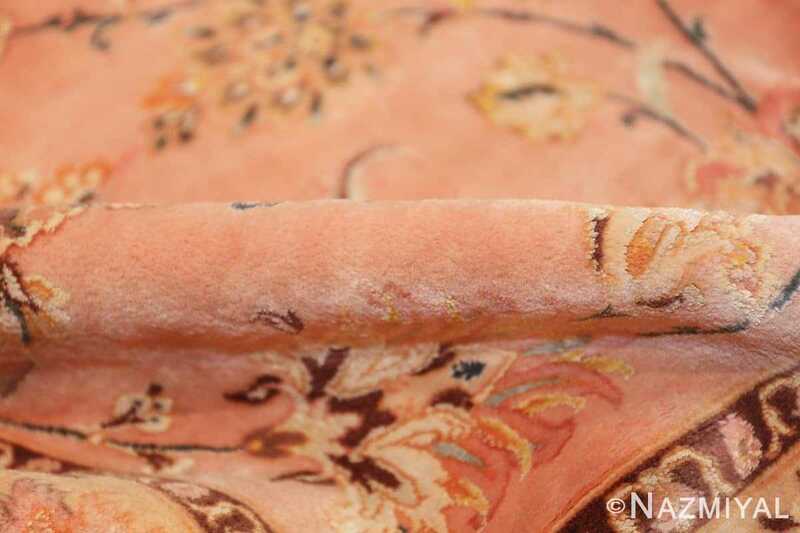 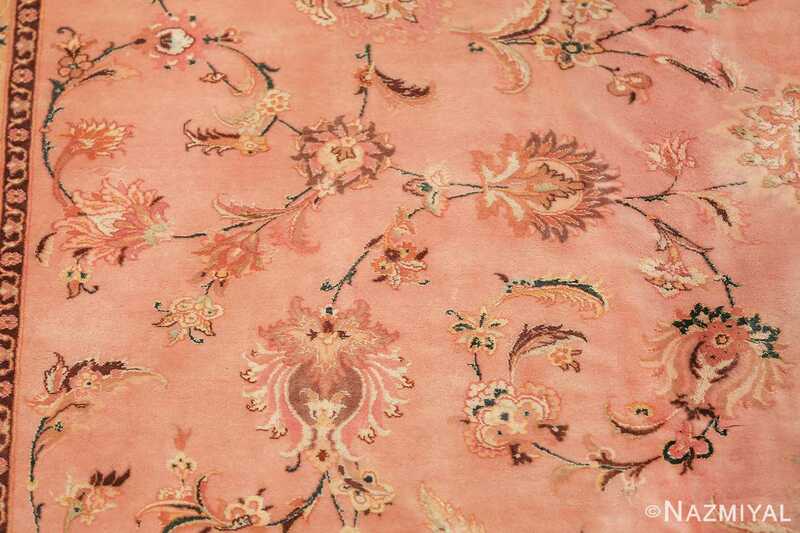 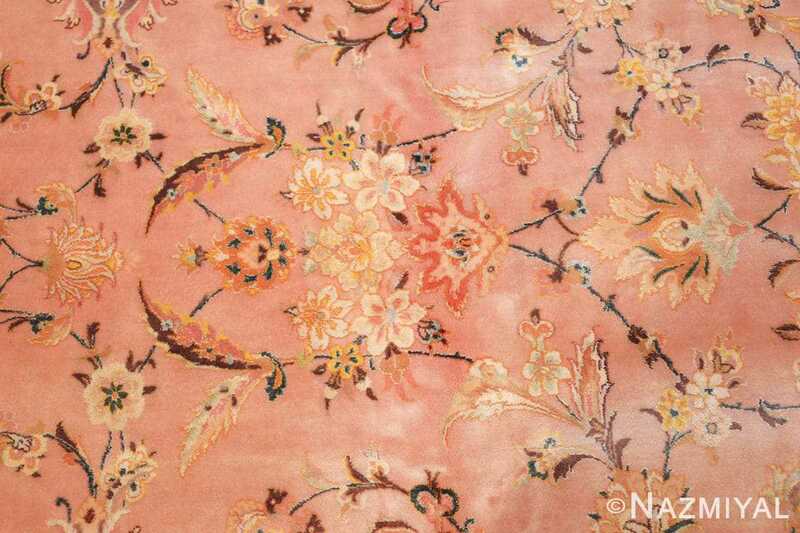 The pink center space of the rug is contained by three layered borders. 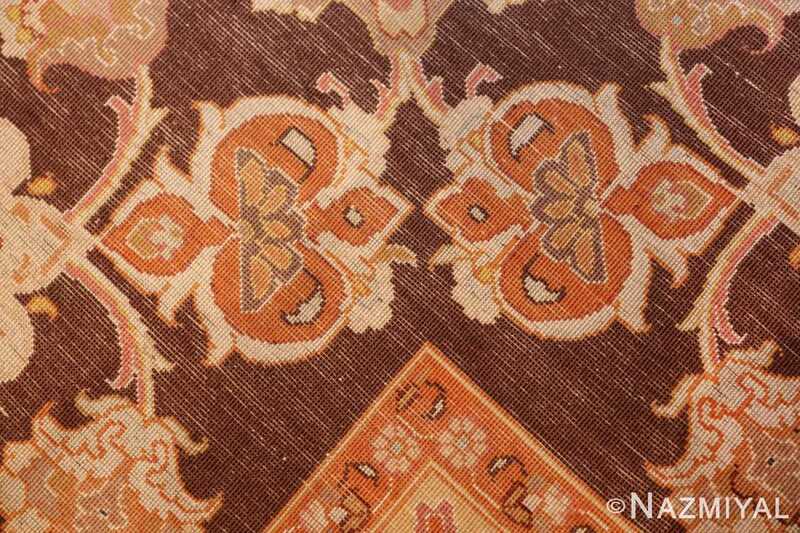 The first and third layers, immediately adjacent to the main border, are mirrored images of each other in lighter colors. 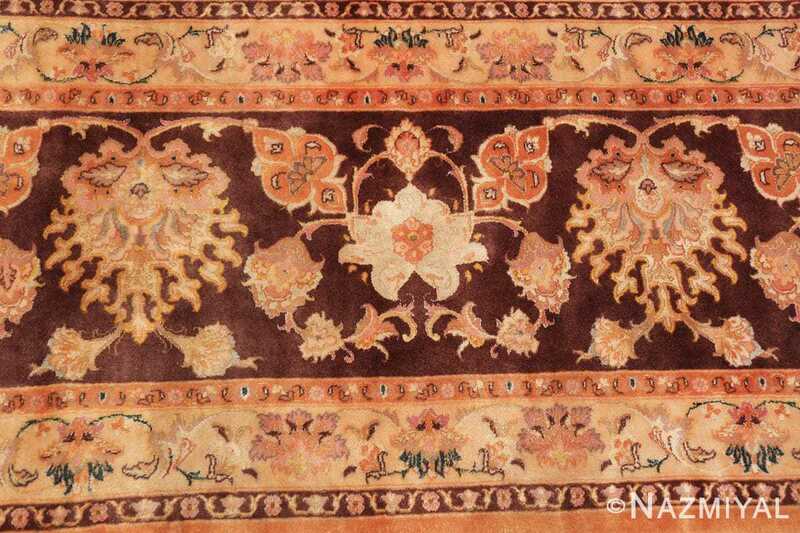 While the main border is defines by a rich purple brown color background and large scale open floral motifs. This main border offers a magnificent anchoring affect to the overall artistry featured in this spectacular silk and wool vintage Persian Tabriz rug.